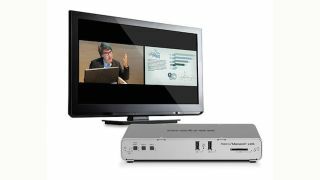 Matrox Video has made its Matrox Monarch LCS lecture capture device available for purchase. The Monarch LCS accepts video from any SDI or HDMI camera and presentation content from computers over HDMI. The inputs can be encoded independently and in sync for use with the latest multi-stream video players. Alternatively, the inputs can be combined prior to encoding in a variety of production layouts, including picture-in-picture and side-by-side, for use with standard video players. Monarch LCS is a reliable, standalone network appliance that IT administrators should find easy to set up and integrate into video management systems (VMS), such as Opencast and Kaltura, and learning management systems (LMS) such as Moodle. An intuitive web interface lets users define profiles for live streamed and recorded lectures, mixing camera and presentation material from SDI and HDMI sources. Powerful scaling, de-interlacing, and noise reduction engines ensure only pristine images are sent from the encoders. For streaming purposes, the encoders use either RTMP or RTSP protocols to deliver live streams to local media servers or cloud-based CDNs. In recording applications, the encoders write MP4 or MOV files directly to network-mapped drives, eliminating the need for post-lecture file transfer, or alternatively to local USB drives or SD cards. Monarch LCS comes with a comprehensive set of HTTP-based control APIs that let network- or cloud-based video management platform developers and AV integrators harness the streaming and recording capabilities of Monarch LCS appliances from within their own environments to create customized user experiences. A control module for Crestron room media controllers is also available. Recipient of five major awards at NAB 2016, the Monarch LCS was honored with Best of Show Awards from TV Technology, Sound & Video Contractor, and Video Edge. It also received a Video Innovation Award from the British Columbia Professional Videographers Association (BCPVA) and was chosen as one of the Best Products of NAB 2016 by Streaming Media Magazine.